While the calendar might say today is the first day of spring, it looks decidedly like winter outside. This is nothing unusual in Canada, unless you happen to live on the west coast. I'm sure there are tulips in Victoria already. This winter we've had a crazy amount of snow, quite a lot of it recently, so I don't expect to see any flowers by the end of this month (I believe my sister really did photograph those crocuses on March 30). When I was gardening last year, we were supposed to start on April 1. There was so much snow, we didn't really get going until the middle of the month, and even then many yards still had snow in shadowy corners. I'm house-sitting for my sister and brother-in-law while they're in France for April (lucky ducks!) and I was planning to get her garden ready by the time they came home. 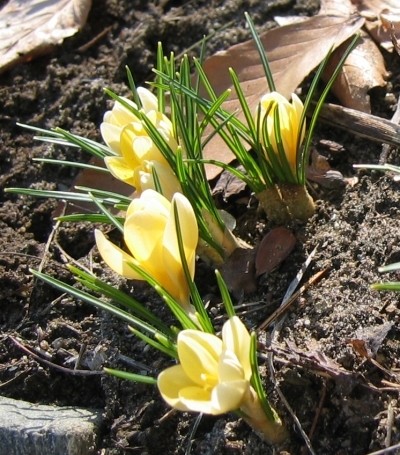 At the rate the seasons are progressing, all I might get done is to clear up the dead stuff we missed in the fall, and see the green buds of crocuses peeping out of the soil. Planting the veggies will have to wait until later. There isn't any garden at our place, although there is a tiny back yard. We're hoping to convince our landlord to let us plant some tomatoes, and set up a compost bin. I'll also have herbs on the balcony, and dahlias at the front door (if the bulbs made it through the winter). Thoughts of warmer days and green things will have to sustain me through these last days of snow, but it's getting more difficult to be content with that. In Vancouver we have crocuses and tulips and elephant ears and rose blossoms and all kinds of things. It is very green and growing, and when the sun is shining, absolutely marvellous, but then it rains and I get homesick for snow banks. You can't win them all! March 20, 2008 at 5:43 p.m.